*Use a SMARTboard marker to trace the uppercase and lowercase letter. *Learn the Sign Language for the letter. pictures and placing the one that does not belong in the trash can. an X through the letters that do not belong. *Introducing letters at beginning of the year. *Reviewing letters at the end of the year. *Using Whole Group, Small Group, or by Individual students. I hope you enjoy this download! 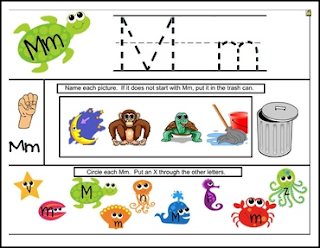 Please check out my TpT store to preview the full pack of 26 letters, with 4 additional slides to build phonemic awareness and 2 additional slides for students to work on sequencing, and positional words such as before, after, next, previous, left, right, etc.